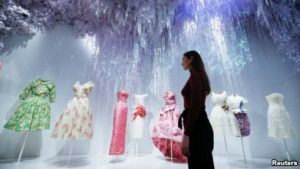 London, February 7, 2019 – From Princess Margaret’s 21st birthday gown to Oscar winner Jennifer Lawrence’s red carpet dress, Christian Dior outfits that have made headlines go on show in a London exhibition dedicated to the French fashion house. “Not only did (Dior) … revolutionize fashion design … but he was also important in how he did business,” Oriole Cullen, Fashion and Textiles curator at the V&A, told Reuters. Dior’s love of Britain – where he staged several fashion shows – is also explored in the exhibition, which is based on a previous Paris House of Dior display. Their designs, worn by royals and celebrities, are mixed alongside the founder’s, each loyal to his legacy and fascinations. Dior was superstitious – his lucky star is on display – and Chiuri has paid homage to that in her creations.